When social entrepreneurs Jack McCarthy and Lex Towle created AppleTree in 1996, they invested in the idea of increasing the supply of effective schools in D.C. through innovation. Today, AppleTree operates as a nonprofit consisting of a research institute and a public charter preschool reaching 2,000 students through community partnerships and campuses across D.C. VPP initiated an investment partnership at a point of inflection for AppleTree’s development to help support the organization’s growth and to further refine its Every Child Ready instructional model. Jack McCarthy, Carol Thompson Cole and Michelle Gilliard tell the investment story. Jack McCarthy – President and CEO, AppleTree: When we developed AppleTree, we wanted to create an early learning program that would address the change we wanted to see in students’ lives. Our theory of action was to build AppleTree from the classroom up and provide our teachers with what they needed to educate children well. We knew that this approach was the way we could expand quality early childhood education in D.C. and ensure that children learn the necessary skills that they need before entering kindergarten. Carol Thompson Cole – President and CEO, VPP: We’re always looking for organizations that have measurable results and that make significant strides toward improving the life of children. AppleTree was on our radar screen for a while because we saw that the organization had a strong mission, visionary leadership and a long track record of achievement. We realized that we could add value by supporting AppleTree’s aspirations to continue to grow with quality. Michelle Gilliard – Partner, VPP: What specifically stood out to us about AppleTree was the rigorous research and the evidence shown of the effectiveness of its Every Child Ready instructional model. We had an amazing opportunity to support the refinement of AppleTree’s instructional model and help them with their desire to expand and grow the number of high-quality early childhood education seats they could offer students in the community. We began our investment with the business planning phase, and that helped us identify which areas of the organization and the instructional model could improve. Jack: It was challenging at the beginning of the partnership. The idea of a major multi-year investment was really attractive, but our perception of how to address our needs was different than VPP’s. We wanted to address everything at once and didn’t fully appreciate VPP’s approach at the time, but it really was a very beneficial process. Although the process was tough, we respected each other every step of the way because we could see that each had something the other valued and thought there could be some synergy. Carol: At VPP, we take a high-engagement approach to our investments, which is not a typical funder approach. One of the things that we learned from our earlier investments was the importance of taking the time to build trust. We became a trusted advisor for AppleTree by contributing our expertise of expanding in the region, capacity building and early childhood education. Also, our board members and investors wanted to be highly involved in discussion around what decisions were being made about refining the Every Child Ready instructional model, which was unique for this investment. They saw the potential in the model and wanted to make sure we made the refinement of the model a priority. Michelle: It was around the mid-investment period for AppleTree when I came on board as the Partner at VPP. Building trust was an important for me to be able to be an effective partner for Jack and for our investment in AppleTree. Our goal was to help AppleTree develop a more robust online platform for Every Child Ready. We understood that if we could integrate the Every Child Ready model onto a more stable and sustainable online platform, then we could help AppleTree achieve their goals to support teachers in the best possible way and to continue to scale. Jack: One of my biggest takeaways from blending VPP to our team as a partner was that you need to trust and make yourself vulnerable and open to the possibility that you don’t know everything. It is necessary to form relationships with people when you may not completely understand the value at the time. Really good things can result, and we are a witness to that. Over time, we developed a good, trusting relationship which became both functional and effective. I was also quite impressed with how VPP got us to change the way we were thinking about our instructional model. We quickly realized that the way we could create a seamless process for teachers to be able to download individual lessons and professional development videos based on student achievement. VPP and Tarek, the consultant that VPP brought on board, really helped us think through the ways in which a new online content management system for Every Child Ready could make the model more user-friendly and could help students learn based on their mastery of the skills. Michelle: Another one of our goals for this investment was to help AppleTree double the amount of students it served, which has been done with quality. The AppleTree@ model, where AppleTree preschools are integrated into existing elementary schools, has been seminal in AppleTree’s growth. AppleTree@, which emerged through the business planning phase of our investment, has helped AppleTree almost double the students served. The AppleTree@ partnerships are still growing are reaching more children in D.C., which has been and will continue to be extremely impactful. Jack: The AppleTree@ model also solved a key sustainability challenge for us. Parents want our preschool locations to be close in proximity to where they live, work and have other children in school. The business planning process gave us the structure and the pathway to do it. Sustainability is a major theme of this investment, and the work that was done through our partnership will positively impact our organization years down the line. We valued VPP’s partnership because they were able to help us clarify our goals and better understand how to reach them, which will help us to sustain AppleTree in the long-run. Carol: What we do at VPP is still considered a new way of philanthropy. A lot of times during investments, we have to be sensitive to our partners to make sure they understand what we do and why we do it. Each time we go through the investment process, there is always a breakthrough moment where our partners understand that we are there with them through the challenges and the successes. When our partners understand that we have the same goal in mind to make young people’s lives better, then they understand why we push back, ask questions, advise and challenge. That’s our value. AppleTree is an entrepreneurial enterprise consisting of a research and development institute and a public charter preschool with ten AppleTree campuses, serving as models for effective teaching and learning. 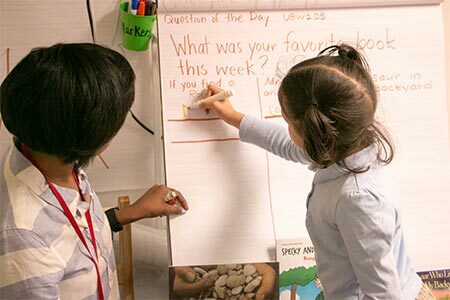 AppleTree Institute for Education Innovation and AppleTree Early Learning Public Charter School work together to produce and use an award-winning curriculum, teacher professional development, and school support systems. AppleTree also supports nine other community-based organizations and local education agencies using its award-winning “Every Child Ready” instructional model. AppleTree’s mission is to close the achievement gap before children get to kindergarten, by providing three- and four-year-olds with the social, emotional, and cognitive foundations that enable them to succeed in school.